Hi, it seems that due to a rocker excessive wear a valve fell into the cylinder and damaged the piston and the engine head. I bought a "new" second hand engine head but the valves and rockers doesn´t look too good also. Could anyone tell me if the center rocker in the picture is acceptable (and the valve, of course) or they must have a shiny surface? Is there a near risk to happen the same thing in the near future? Unfortunately it´s not going to happen, the car was bought in Germany, so I´ll have to find a solution to save the engine. In your opinion the ugly textured surface of the valve and the rocker is going to wear very fast from now? Should I buy new components and change them? It seems that it's a(nother) known problem for engines with high mileage. Here's a material, from our Russian colleagues. The problem is discussed in detail at 9:13. -07, 245000km, still on the same drivetrain as it left the factory with (and clutch!). Only had the rear diff rebuilt. Regular servicing since new and still going strong, but for how long??? Camshaft, clutch and turbo paranoia is always in the back of my head. I am used to change the oil about 10000 km (6000 miles). The problem is that the oil I've used in the past has become less and less qualitative. I mean Castrol A5. After only 2000 km (1250 miles) since last change, is like water. Both visually and the feeling when you rub it between two fingers. I don't want to imagine how it will look such oil after 24000 km (15000 miles) how LR suggests, if after a tenth of that period it looks that way. And the effect it will have on the internal parts of the engine. For the moment I've switched to Motul Specific 913D and it seem that the engine is sounding much better and also the organoleptic feel is much more "oily". In my opinion, an 5W40 oil like VW 505.01 used on PD TDI engines is much more indicated, because that one was specifically designed to withstand the additional valve train forces necessary actuating the pump injectors. The thing with fuel economy of 913A/B/C/D oils are rubbish in my opinion, on this particular application. Roads? Where we're going we don't need roads... Go beyond ! I have been using TOTAL 5W30 QUARTZ 9000 FUTURE NFC 5L the two last times. I have no idea about the quality of this oil but guess everything is better than "noname" oils...??? I'm not following this. How does rocker wear allow a valve to fall into the cylinder? The rocker arm forces the valve into the cylinder against the pressure of the valve spring. If the rocker arm wears the valve won't go into the cylinder. If you're using the same oil and it's degrading so more quickly I'd suggest your engine is developing excess heat, or perhaps diesel is diluting the oil. That's possible if your rings aren't sealing which is quite likely in a high mileage engine. I'm not following this. How does rocker wear allow a valve to fall into the cylinder? The rocker arm forces the valve into the cylinder against the pressure of the valve spring. If the rocker arm wears the valve won't go into the cylinder. As in the OP picture, the valve tip is wearing the rocker arm, which develop a hole, through which the valve tip will protrude. In that moment, the rocker arm will not press onto the valve stem/tip anymore, but will press onto the laterals of the spring retainer. 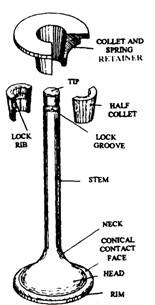 And once you press onto the retainer, the half collets will eventually come/fall out, allowing the stem/valve to fall into cylinder. Ah, I see. I couldn't tell what I was looking at in the pics. All I can say is Holy Crap. I've had some high mileage cars (I have a 1962 Falcon) but I've never seen a rocker arm wear like this. Terrible! Sorry to hear that! My car was for about 3 month in a repair shop and even after a full engine head restoration the engine doesn't run very smooth. Cold start is tricky, and the rockers are noisy at idle. Maybe it would be a better option to buy another engine. Thanks! My car is in the repair shop now, cylinder head being rebuilt... I guess it will be ready in 2 weeks. I'll share the results when I get it back.